El Kazrah was the first foal that we bred in 1993 and still lives with us today, alive and healthy... I remember the day as if it was only yesterday. Her dam was a regal white mare that was saved from the doggers in immaciated shocking condition and she was restored back to good health and then we leased her and bred our 1st foal. That morning when Kaz was born i had to drive to Port Macquarie so you can imagine how excited yet dissapointed i was when i seen my mare was getting very close to foaling and i wasnt going to be there to see our first ever foal born for our stud.. Thankfully my husband was and at 7am El Kazrah was born.. the most beautiful dark liver chestnut filly foal... what a dream come true she was.. to say that El Kazrah was spoilt was an understatement.. Kaz grew into a lovely grey mare of substance and strong bone.. amazing movement and temperament.. she was broken to saddle as a 2 yr old and was ridden occasionally and always such a good girl.. never a fuss to saddle Kaz up. 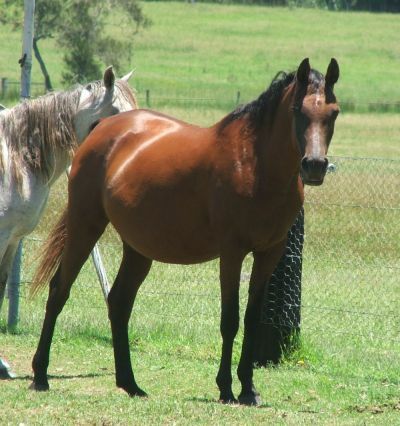 She has bred us 5 beautiful foals, 4 fillies and 1 colt foal. 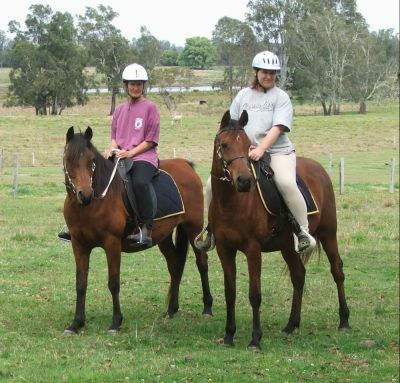 issue's what so ever..if i have to round the cattle up, Zena is the horse..
"Simeon Shoshana" (With my sister in Purple Shirt) & "Briarwoods Sweet Expectation"
Photo taken on 14-9-08 before a trail ride.. Two treasured mare's. a brilliant mother to her foal. 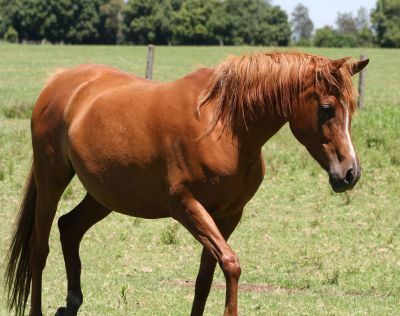 She is a young kind mare and a lovely girl to have around. 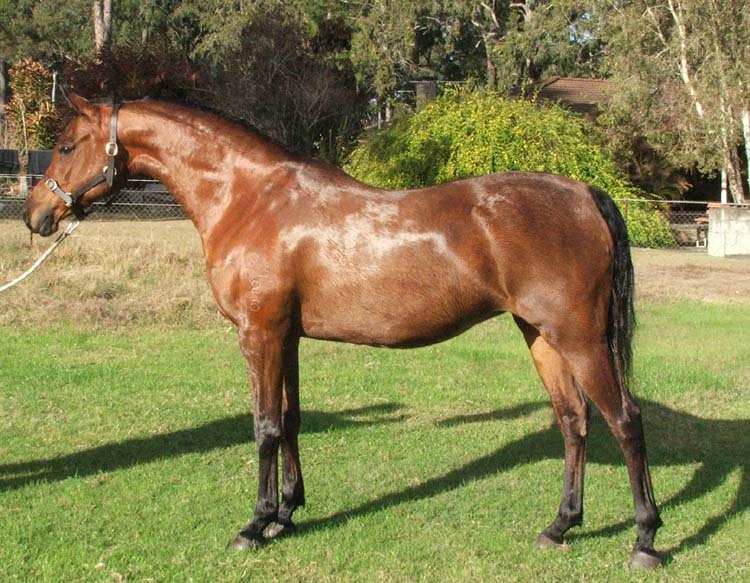 One of only 4 daughters of her internationally renowned exotic sire here in Australia, it was a fantastic opportunity to have been able to purchase this beautiful mare and have her in amongst our broodmares. To say she is rare on Australian soil is an understatement and we are very honoured to call her ours. We are very excited to see what she produces for us, we know her bloodlines work for us.. now to see the result when time comes !